Otto Penzler’s giant anthologies, including the 1,056-page The Vampire Archives, The Big Book of Adventure Stories, and The Big Book of Christmas Mysteries, occupy a place of honor in my collection. So I was very excited to see he’s releasing another one next week: The Big Book of Sherlock Holmes Stories, one of the biggest collection of Sherlock Holmes stories ever assembled. Arguably no other character in history has been so enduringly popular as Sherlock Holmes. Ever since his first appearance, in Arthur Conan Doyle’s 1887 novella A Study in Scarlet, readers have loved reading about him almost as much as writers have loved writing about him. Here, Otto Penzler collects eighty-three wonderful stories about Sherlock Holmes and Dr. John Watson, published over a span of more than a hundred years. Featuring pitch-perfect cases by acclaimed modern-day Sherlockians Leslie S. Klinger, Laurie R. King, Lyndsay Faye and Daniel Stashower; pastiches by literary luminaries both classic (P. G. Wodehouse, Dorothy B. Hughes, Kingsley Amis) and current (Anne Perry, Stephen King, Colin Dexter); and parodies by Conan Doyle’s contemporaries A. A. Milne, James M. Barrie, and O. Henry, not to mention genre-bending cases by science-fiction greats Poul Anderson and Michael Moorcock. 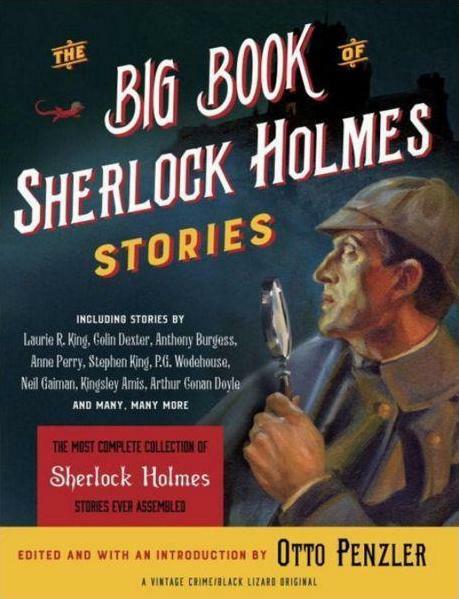 No matter if your favorite Holmes is Basil Rathbone, Jeremy Brett, Robert Downey, Jr., or Benedict Cumberbatch, whether you are a lifelong fan or only recently acquainted with the Great Detective, readers of all ages are sure to enjoy The Big Book of Sherlock Holmes Stories. The massive volume contains stories by Laurie R. King, Colin Dexter, Anthony Burgess, Anne Perry, Stephen King, P.G. Wodehouse, Kingsley Amis, and many, many more — over a century’s worth of cases, from Conan Doyle’s 1890s parodies of his own creation to Neil Gaiman’s “The Case of Death and Honey” (published in 2011). There’s also appearances by other great fictional detectives, including Hercule Poirot and C. Auguste Dupin. 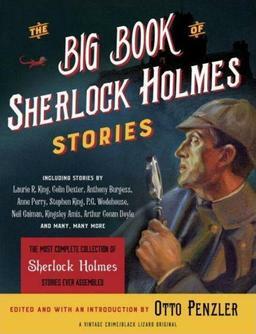 The Big Book of Sherlock Holmes Stories will be published by Vintage on October 27, 2015. It is 816 pages, priced at $40 in hardcover, $25 in trade paperback, and $15.99 for the digital edition. This collection is all previously released material. Much of it is hard to find. I’ve already per-ordered mine! These enormous Black Lizard collections are always at the top of my “must buy” list. As Bob said, all previously released, but nice to have in a single volume. I’ve read most of what’s in it but will read it all once it’s in hand. I too love these large Black Lizard collections edited by Otto Penzler.